What symbol/figure should I use to demonstrate a game ended in a draw in a table? 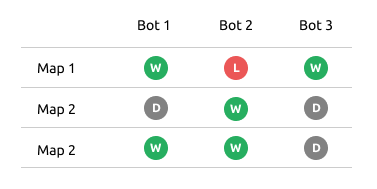 In my program, a user will write a bot and at the end of the benchmark it will be showed to them a table showing how the bot did against some premade bots in some maps. Even though I am satisfied with the green check mark and the red X, I'm not entirely confident about using an equal sign to demonstrate a game ended in a draw. Is this the best approach? Personally I prefer to show "signs" than to write "Win/Loss/Draw" but I would like to hear some opinions. I'm open to suggestions about the check mark and "X" too. Not the answer you're looking for? Browse other questions tagged layout tables or ask your own question. Should I use a radial menu design for a touchscreen game? Should table rows be numbered? Table head labels should be bigger? Should export of an editable table view to Spreadsheet reflect user edits? Should I set maximum table width? Should searching a table include hidden columns?